It has taken over 24hrs from seeing Rogue One to writing a review. Why, well it has taken that long to digest, unpick and critique what was witnessed in a cinema not so far away. Once the process was complete a dilemma was set, a lot of credible people have reviewed and expressed an opinion about Rogue One. These authors have given their thoughts and feelings on the latest instalment to carry the Star Wars flag. At OSGR the force is strong and as life long Star Wars Fans (minus the first 7 years of life before 77 and the year lost in Ayia Napa in 92 (it was brutal - man brutal)) OSGR wanted to be different in this review. Remember ‘Everybody’s free to wear sunscreen’? There is a verse in the song that goes - “Be careful whose advice you buy, but be patient with those who supply it. Advice is a form of nostalgia, dispensing it is a way of wishing the past from the disposal, wiping it off, painting over the ugly parts and recycling for more than it's worth.” It is these words that have given a structure to this review, it is a kind of review of reviews. So many people have dispensed advice on Rogue One we should be patient and take our time to see what they have said. There was a strong feeling that by completing a single OSGR review then it could be construed that OSGR were just recycling it for more than its worth. To throw just another review into this boiling pot of opinion without looking at the opinions of others is pointless now the film has been subdued by the Sith like reviewers. So here goes – but before it starts there is a little disclaimer to all those are about to be quoted and all those receiving a nod too in this blog – OSGR salute your opinion, apologises for those left out and trust me on the sunscreen. Rogue One was finally released and after a week of avoiding spoilers, leaving Twitter & shutting eyes to Facebook, OSGR was ready. Arriving at the cinema early, coffee was consumed, popcorn/coke was purchased and seats were taken (best in the house of course, comfort is important at this age). The lights dimmed and the wait for the immortal words “In a Galaxy Far Far away” was commenced….. Skip to three hours later and the shocked emoji face was one left on the cinema goers faces. What was just witnessed? Was it a good shocked emoji or a bad shocked emoji? Was Rogue One a triumph? As stated earlier OSGR needed time – pleasure sensors had been lit up and (like Palpatine’s hands) synapses were firing chaotically. With all this in mind Rogue One reviews were poured over and summarised in the hope that a considered critique of the film could be written. To note, with the variety and sheer numbers of reviews three common themes were identified, debated and summarised in this blog. Finally, let’s not detract; overall there are a lot of positive reviews on Rogue One and some proclaiming it to be on par with Empire! Without further to do, like a Wampa picking the bones of its victims, lets digest Rogue One. The Story – Lets get those plans! Lets hit this head on - Variety sum up Rogue One as “Younger audiences will be bored, confused, or both. But for the original generation of “Star Wars” fans who weren’t sure what to make of episodes one, two, and three, “Rogue One” is the prequel they’ve always wanted.” An interesting review – is this a film purely for the old guard of Star Wars Geeks (like OSGR), can it stand alone to those who know nothing of Star Wars? It’s an interesting thought. Stopping for a moment to think who this film was written for kind of nulls the argument that this film was for the fans of the original. It’s a statement written in virtually every premier magazine/web site review on Rogue One. A thought arises – lets look at prequels, sequels and spin offs. The reason these are funded is due to the popularity of the initial film. It is this popularity that enables comparison and reflection on the new instalment. 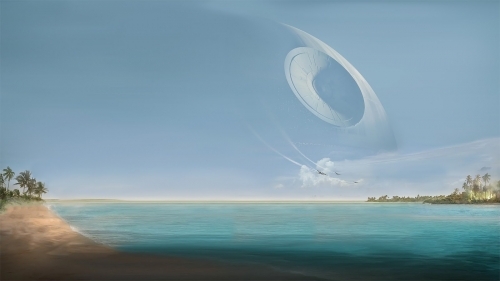 Rogue one nods at this and understands where it fits in the genre and series of Star Wars. Although it attempts to identify itself as a stand-alone movie it only accomplishes this in its characters and characterisation. The Cameos and Easter Eggs ensure that the film is able to embellish itself in the Star Wars series. Every film is represented in one way or another within the films borders. As for younger fans being confused, I’m unsure if this film is meant to be seen with no connection to its counterparts or to be seen as a sum of its parts only. Sarah Buddery at Jump Cut UK explains this more eloquently “It is sometimes easy to forget you are watching a Star Wars film when watching ‘Rogue One’, however this is in no way a criticism. It combines elements you love from Star Wars, yet creates a film which could just as easily stand on its own”. It’s hard to understand why Rogue One would confuse its younger audience? It’s a shame that Peter Debruge in the Variety review does not elaborate on this. However if you are taking children to see Rogue One OSGR highly recommend reading “A parent's guide to Rogue One: Should you take the kids?” by Anthony Breznican it’s a well-written blog that parents will appreciate. One other theme of the film that is considered is the characters. Firstly lets remove some of the more obvious cameos like Darth Vader for the moment. As the film attempts to builds characters quickly, it utilises the first third of the movie to create their back-stories, whilst inserting them into the Star Wars story. These characters have come into some turret flak in some reviews. They describe a lack of depth and little engagement as stand-alone characters. This may be true, however there appears to be a little confusion about the characterisation of the leads and their place in this film. Most reviews seem content in aligning their portrayal against well-established and Iconic figures in Star Wars. For instance Krennic being compared to Vader and Cassian to Han Solo is just Bantha Fodder. Michael Doran goes even further in his review at Space.com in that “If the film missteps even a little bit (and it’s probably better described as unnecessary steps), it’s the number of callbacks and touchstones to the original films it does manage to squeeze in. Some moments work better and more organically than others, while some seem a little forced and obligatory, momentarily distracting from the unfurling newness of it all”. There are some cameos that do seem a little ‘ham fisted’ in their presence but they are so fleeting that they give more of distraction than a game changer in the film. The Rogue One characters are not meant to be the heroes of the rebellion or the orchestrators of the Empire’s rule. They are anti-heroes (especially Cassian Andor), pawns and their characters are to be viewed as flawed and desperate. Lucas Seigal Describes this very well in the Comicbook.com review when they describe the characters “the personal relationships and individual characters are what made this movie shine. In war, you don't need to know every detail of a person's life to know whether you're willing to fight alongside them, to die for, or with them. In that aspect, the relationships here were 100% natural and realistic”. The film is not setting up a saga, more complementing one. Much has been written about the lack of a male lead and the strength of a female lead in Jyn. This is unfair as the most loved Star Wars films fail to set a lead and their storyline is based on a flawed family concept with a mixture of main characters. It’s this distinct lack of singular leads in the Star Wars films that allowed us to establish an allegiance to our favourites. OSGR is a Han all the way, yet some of the friends of OSGR are Sith Lords, Leia fanatics and even Hamill harbingers (even Kylo and Padame nerds are littered through the Star Wars boards of Twitter and Facebook). Why then should Rogue One be the only Star Wars film to have to select a Female and Male lead. As James Dyer describes in his Empire review “Rogue One shakes off formula and goes rogue itself, that it finally fulfils its promise”. This is the strength of Rogue One all though not everyone agrees. Is it because it’s a spin off/prequel? Does the premise that it can stand alone demand an identification of lead? I’m not sure that it does, Star Wars has always utilised its main characters as the protagonists of its play – the scripts demand that they interplay with each scene and act, dancing through them like a Twi’lek at Jabba’s Palace only to be devoured by the films final act which is both spectacular and meaningful to its theatre audience. 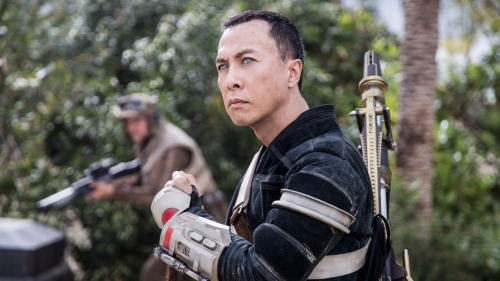 Total Films Matt Maytum (in games radar) highlights this in his article “Everyone from Riz Ahmed’s defected Imperial pilot to odd-couple warriors Chirrut and Baze (Donnie Yen and Wen Jiang) feels developed, and has a chance to shine without it feeling like arbitrary box ticking. Alan Tudyk steals all the laughs as K-2SO, a reprogrammed Imperial droid who’s something like a sassier, snarkier, tougher Threepio”. In OSGR’s opinion Rouge One accomplishes the use and development of a main set of characters. These characters have one film for the viewers to either love or hate not over 9 hours to fully establish themselves. The comparison to established figures in the Star Wars saga is both crass and uncalled for – It is a testament to the writers that we are able to establish a connection to the new characters in Rogue One. Rogue One is directed in such a way as to end up feeling for the characters as the feast of an ending plays out, even when they have had such a short time develop. To compare their development to established developed characters is like comparing Stormtrooper blaster fire with Obi Wans Lightsabre, yes it misses the point. One thing is certain the director and script writers would have had howls in the halls if they established a film that had no links to a new hope and had left out iconic characters, but it doesn’t and for that its better. The littering of cameos and easter eggs when they are placed in the film really give it a place in the halls of the saga. It’s too early to proclaim its ranking (OSGR need to see it a least another 50 times). As it settles and implants into the Old Sci-fi brain it will share merit with the original trilogy. 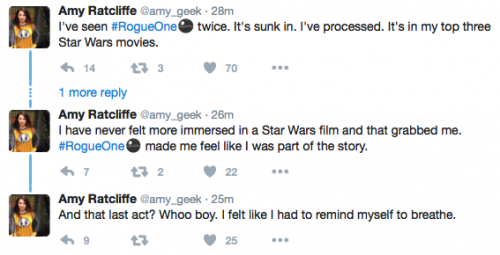 Here are some Twitter fans reactions to Rogue One explaining that point. The Hollywood Reporter hones in on this different tack in that “What fans will get here is loads of action, great effects, good comic relief, stunning locations (Iceland, Jordan and the Maldives) and some intriguing early glimpses of the Galactic Empire as it begins to flex its intergalactic power”. This is proclaimed in many of the reviews read. Nerdist Reviewer Kyle Anderson goes further in that “The direction by Gareth Edwards is quite gorgeous and gives the Star Wars universe some much needed immediacy and consequence. This is a war movie and is shot as such, and one should know up front that this is a very violent movie, because war is violent. The planets visited provide a great change of pace, and the exterior photography is beautiful. There’s a sheen that The Force Awakens had that Rogue One doesn’t, but that’s to its credit rather than its detriment. This feels much more like a movie for older people while still being within the family-friendly universe”. This certainly plays to the movies strengths and the last half hour of the movie particularly plays to this in time honored Star Wars fashion. The main reviews have all found the quality of the cinematography encapsulates the films beauty and the effects are weaved by the wizards of Industrial Light and Magic in such away to make you breathless. Lets just take a moment to put the film in context and it is summed up eloquently in J Q Ronan’s Review on ‘There has been an awakening’ site “Rogue One also displays the Rebellion’s dark side simply by having characters reveal the organisation’s weaknesses”. This gives the film depth and character. Its darkness is the shining light of this film and there is no wonder its being spoken about in the terms of Empire. Can it be proclaimed into the halls of Star Wars top 5 from the reviews alone? Lets just remind ourselves of the reviews of what is considered to be the best film from the genre ’The Empire Strikes Back’. Back in 1980 some of the most considered film review publications had some considered opinions on Empire. The Hollywood Reporter in 1980 reported “The Empire may not top Star Wars, but it certainly makes one look forward to whatever new surprises George Lucas and his band of cinematic wizards can conjure up for us. — Arthur Knight”. Also Variety stated in their 1980 article that ‘"The Empire Strikes Back" is a worthy sequel to Star Wars, equal in both technical mastery and characterization, suffering only from the familiarity with the effects generated in the original and imitated too much by others’. Both articles highlight that the stimulated debate on any new Star Wars movie will always bring considered opinions and ‘painting over the ugly parts’. Reviewers can give us a measure of a movies success, but when read singularly do they give a full picture. OSGR has digested reviews some leaving a warm glow of satisfaction whilst others have left a taste of ‘The Klatooine paddy frog’ in the mouth. Some of the latter were due to a feeling that they were written to be controversial rather than a critique of a film, however that’s not to say that these opinions were not important and enhance the debate around the movie. 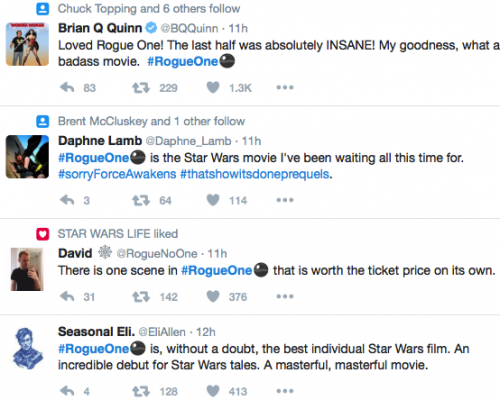 Like the old Empire reviews - Rogue One should not be measured on a single review written on an opening weekend. This review centres on the three main themes from the reviews, however there are many more out there and worth a read. In OSGRs opinion and the opinion of many reviewers Rogue One is a triumph. A twinge of jealousy is held for those using Rogue One to introduce themselves to the fandom of Star Wars (my word, OSGR going Sith??). This twinge is born from the knowledge that new fans have got 7 great movies to watch and the iconic characters glanced at in the film are going to become a whole lot better. Trust me on the Sunscreen - Geek Out.